El Moez is actually an Arabic name. His real name was Abu Tamim Maad El Moez LeDin Allah, but the name was too long for a street, so people call it El Moez Street. However, the last name, Al Fatimi, was not the guy’s last name. It was actually a description that meant he belonged to the Fatimid Caliphate. ‘Glorifier of the religion of God’ was the name that always people described El Moez by. He was the fourth caliph of the Fatimid dynasty and the 14th Ismaili Imam. His reign began in 953 and lasted for 22 years. The power of the Arab Fatimid Dynasty was quite dominant during his reign. Besides, he was the one to move the center of the dynasty from North Africa to Egypt. The Fatimid dynasty was the duration where the city of Cairo came into being. Cairo was actually the new capital of the Fatimid caliphate.During El Moez’s reign, people had always known him for his amazing acceptance of other religions. El Moez was a Shia Muslim; however, he was quite famous among the Christian and the Jewish communities. Above and beyond, he was the one who ordered the invention of the first fountain pen. The fountain pen was actually a pen that did not stain either the hands or the clothes. El Mui'z Street still starts out at Bab Zuweila, the only remaining gate of the southern walls of Fatimid, Cairo. The gate itself was not constructed until the Mamluk Period, during the 11th century. The Caliph used to watch the annual pilgrimage caravan going to Mecca from here, and this gate was also notorious as the site for public execution. The criminals were hung from the gate's walls. Sometimes the severed heads of criminals would be displayed along the tops of the walls. This was done as recently as 1811, when the severed heads of Mamluks from the Citadel massacre were mounted on spikes here. This gate is named for the tribe that was garrisoned nearby. Bab El Naser, Gate of Victory, is one of three remaining gates in the walls of the Old City of Cairo Egypt, in Islamic Cairo, it is a massive fortified gate with rectangular stone towers flanking the semicircular arch of the eastern Portal. The original Bab al-Nasr was built south of the present one by Fatimid general Jawhar as-Siqilli under Imam Moiz when the city was first laid out. Later Vazir Badr al-Jamali under Imam Mustansir enlarged the city and replaced the first gate with the present one, naming it Bab al-'Izz (Gate of Prosperity). Despite this, the inhabitants have shown preference to the original name meaning "Gate of Victory", which has remained in use to this day. 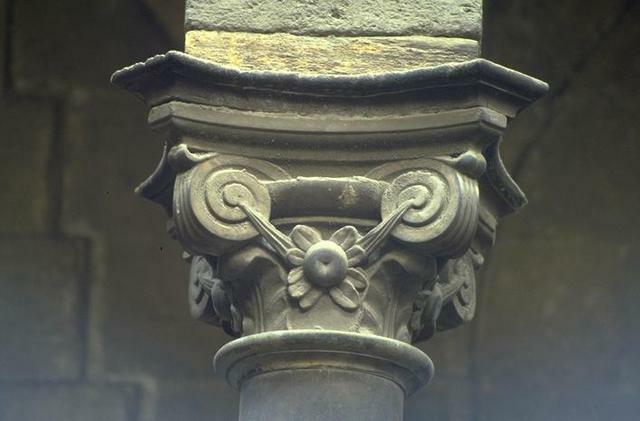 A significant decorative feature is the shields on the flanks and fronts of the protruding towers, which symbolize victory in protecting the city against invaders. Napoleon later named each tower of the north wall after the officers responsible for its security. The names of these French officers are carved near the upper level of the gates. Bab El Futuah, one of three remaining gates in the walls of the Old City of Cairo The gate was part of fortification built by Commander/Vizier Badr al-Jamali of Fatimid Imam/caliph Mustansir. Its rounded towers were a stronger defense than the square towers of Bab al-Nasr (another Old City gate, just to the east). They had shafts for pouring boiling water or burning oil on attackers, and arrow slits. The gate is covered in vegetal and geometric motifs. 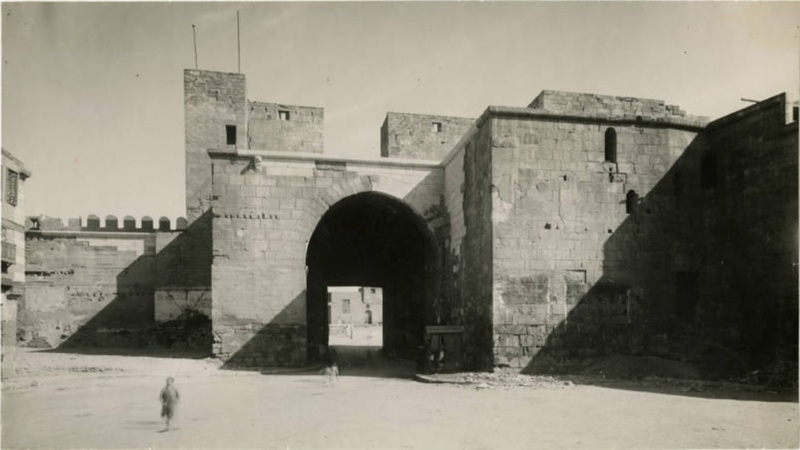 Bab El Naser, Gate of Victory, and Bab El Futuah, Gate of Conquests. 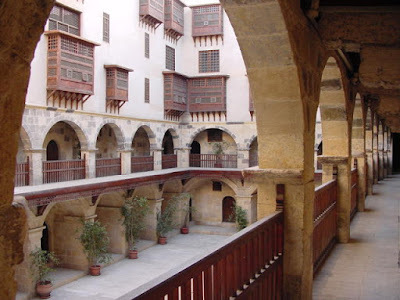 They were both built in 1087 and were enlarged by Salah El Din Al Ayouby. It is possible to walk on the walls and near these gates by jumping from the roof of Mosque of Al Hakim and then to the walls. 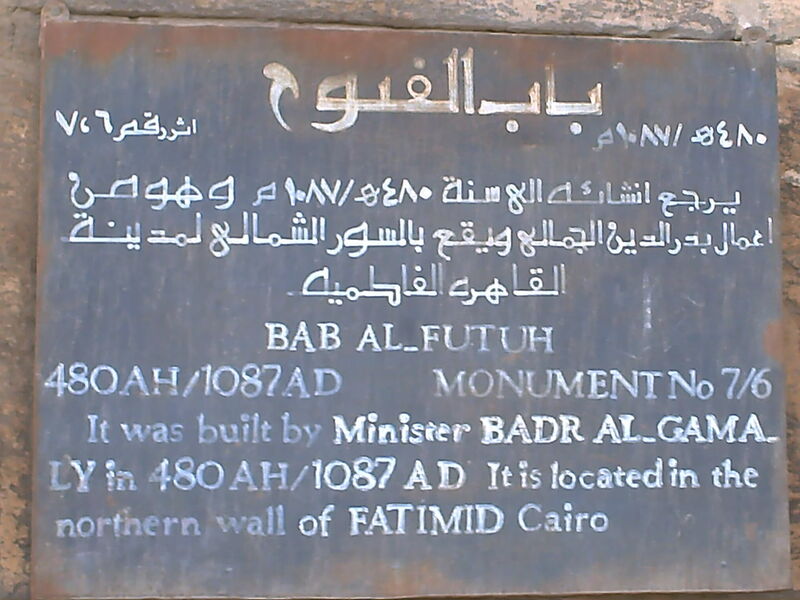 These gates demonstrate a great example of how Cairo was protected in the Fatimid period. 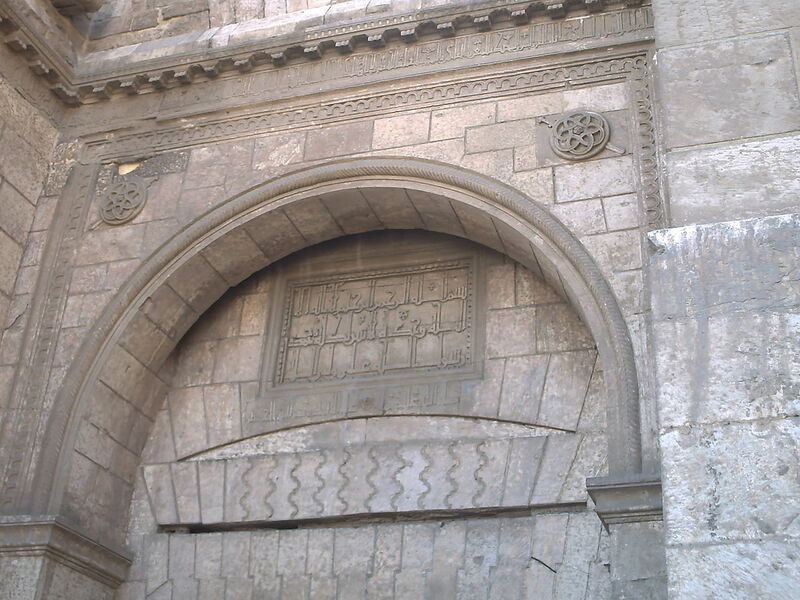 Bāb al-Baḩr (the Gate of the Shore), built in 1174 by Bahā’ al-Dīn Qaraqūsh, near northwest corner in the northern wall; destroyed in city modernizations by Muḩammad ‘Alī in early 19th century. Bāb al-Barakīyyah (the Gate of Blessedness?) I, built by Jawhar al-Şaqalī; destroyed in 1936. Bāb al-Barakīyyah II, built by Şalāh al-Din in 1184; part of the eastern wall which was built far to the east to allow expansion of the city eastward from the Nile. 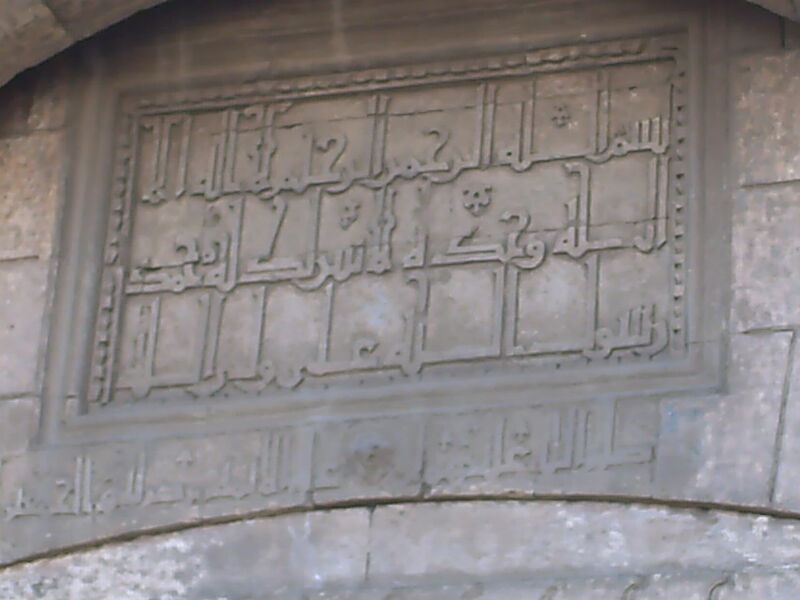 Bāb al-Faraj (the Gate of Succour), in the southern Cairo wall at the hall where the tomb of Set Seada is located. Al-Bāb al-Jadīd (the New Gate), built in 1170 in the eastern wall; still remains. Bāb al-Wazīr (the Minister's Gate), opened in 1341 by the wazīr (vizier—minister of state) Najm al-Dīn Muḩammad; still remains. The garlic and onion market. There are many garlic shops in the area and it is famous for this kind of trade. At the end of this market, there is the Mosque of Al Hakim Be'amr Allah, Ruler by God's Command(Arabic: مسجد الحاكم بأمر الله‎, Masjid al-Ḥākim bi Amr Allāh), nicknamed al-Anwar (Arabic: الانور‎, lit. 'the Illuminated'), is a major Islamic religious site in Cairo, Egypt. 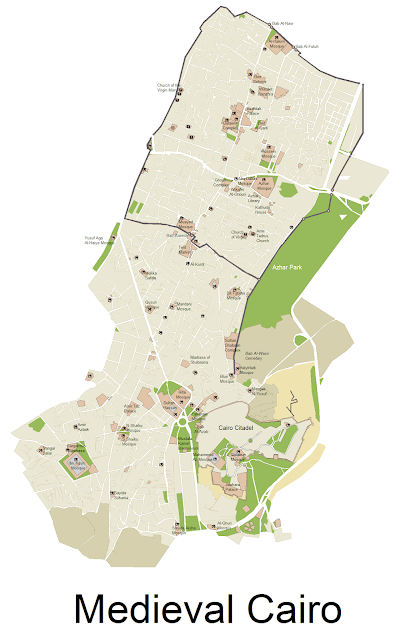 It is named after Al-Hakim bi-Amr Allah (985–1021), the sixth Fatimid caliph and 16th Ismaili Imam. the third Fatimid Caliph. He ruled when he was only eleven years old and had his tutor murdered when he was fifteen. He is famous for his strange actions and violence. He even ordered shoemakers to stop manufacturing shoes for women to prohibit them from leaving their homes or walking in the street. This mosque was actually built by his father by Al Hakim, completed in 1013, and was used as a prison for crusaders in the period of Mohamed Ali. 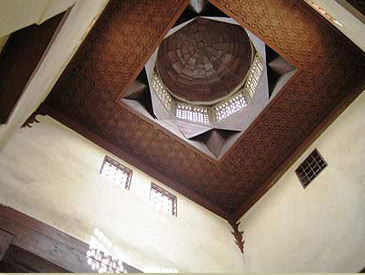 It was restored in the 1980's and is now a good example of the Islamic art of the period. 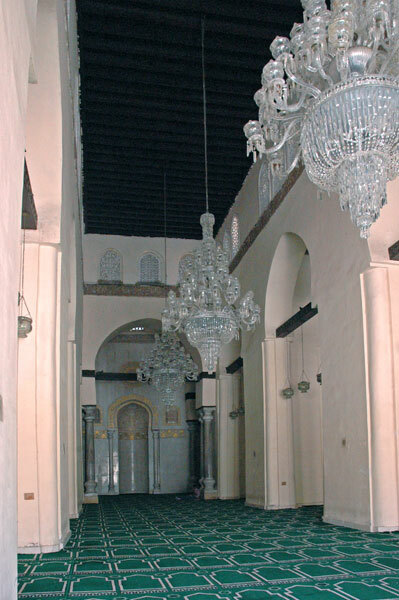 At various times, the mosque was used as a prison for captured Franks (i.e. Latin crusaders) during the Crusades, as a stable by Saladin, as a fortress by Napoleon, and as a local school. 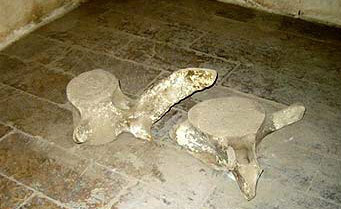 As a result of this the mosque had fallen out of use. In 1980 ACE/1401 AH, the mosque was extensively refurbished in white marble and gold trim by Syedna Mohammed Burhanuddin the head of the Dawoodi Bohra, an international Ismaili sect based in India. Remnants of the original decorations, including stucco carvings, timber tie-beams, and Quranic inscriptions were restored as part of the renovations. 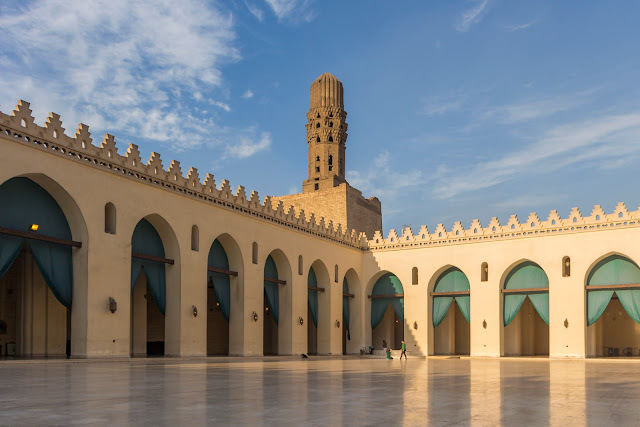 The most spectacular feature of the mosque are the minarets on either side of the facade, reminiscent of the propylon to a pharaonic temple. 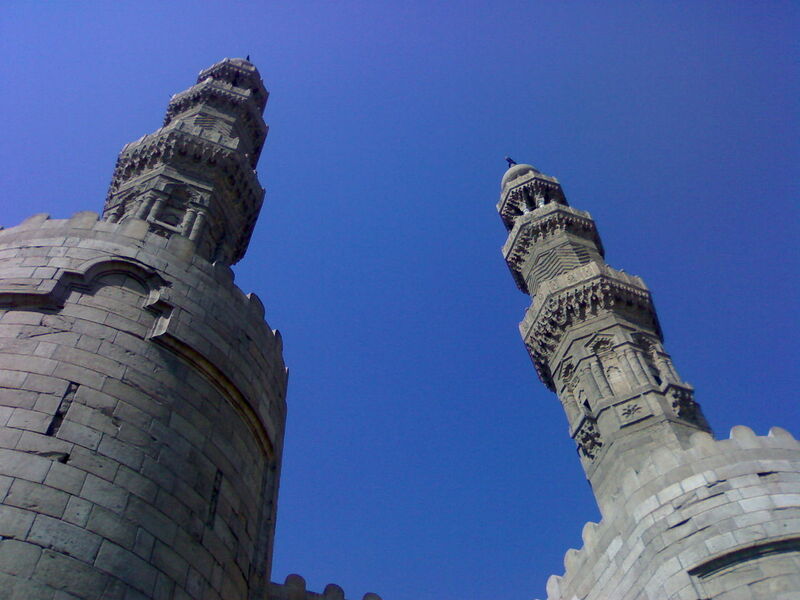 Originally the two minarets stood independent of the brick walls at the corners. 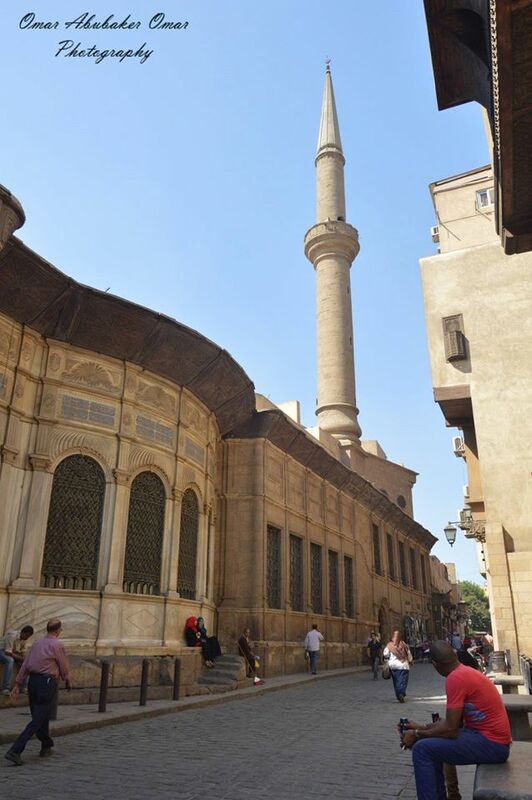 These are the earliest surviving minarets in the city and they have been restored at various times during their history. 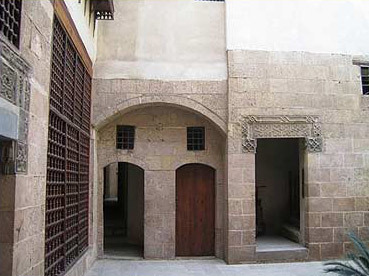 Bayt El Suhaymi is the first building on the left hand side of Darb El Asafar, a narrow corridor in Fatimid, Cairo. From the outside, the building seems to be in a very good state. 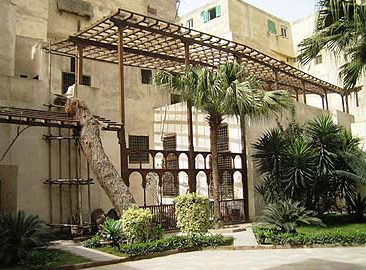 This is because it was restored in 1997 under the auspices of the Arab Fund for Economic Development as part of the Bayt El Suhaymi Area Documentation and Restoration. 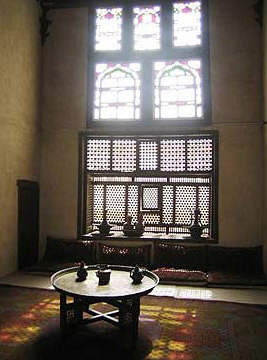 Many mashrabeya windows, which I have become fond of, can be seen from outside the house. small rooms with huge wooden doors. 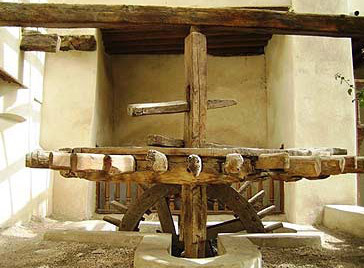 They were used for servants to stay in and cook or do anything needed in the house. 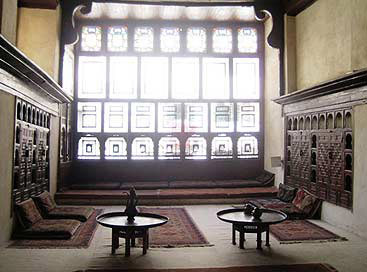 One of the rooms to the left had a fascinating mashrabeya screen with small windows in it to enable the people inside the room to view the sahn. At the end of this corridor full of small rooms, there is the first guest room or salamlek. 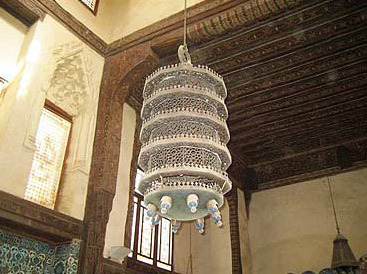 It was used by El Suhaymi to welcome his male guests. 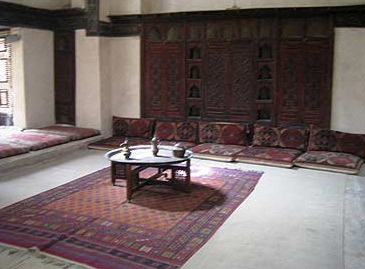 It is a small hall that has brown wooden cupboards all around the left part with an alabaster table in the middle and many beautifully decorated carpets on the floor. 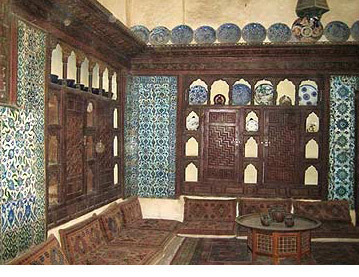 To the right, there is a sitting area with a small Mashrabeya screen. This hall is a good example of the salamlek, or public place, as opposed to the haremlek, thedepressing. The ceilings in the past were works of art. private place. Most of the Salamlek area is on the ground floor, while the haremlek is on the upper floor. This was because in the Islamic culture, house were "Sakan" a word deprived from "Sekoon" which means quietness and privacy. This notion was well respected during the archaic Islamic period. the balconies which was also used on hot days. 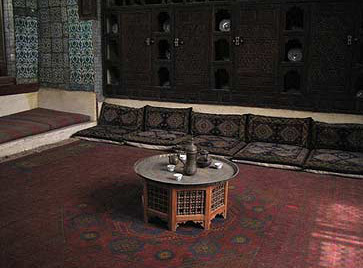 During the heat of the day, shaded courtyards, balconies and roofs became the living areas, while in the cool of the night, the family would move indoors. Many people even today continue to live like this, particularly in more rural areas. This balcony overlooks the sahn and the whole house around it.The seating was on pillows on the floor as well. 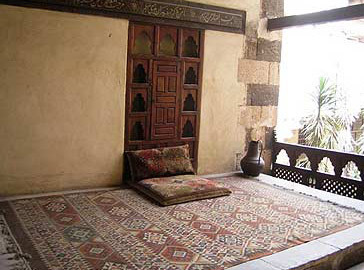 One significant aspect of this balcony is the Islamic decorations on the walls. There are many Qur'an verses around the balcony written in a gold color with a brown background. 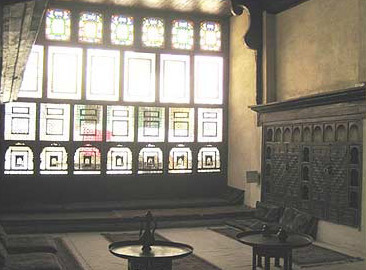 The balcony is also a wonderful place to view the mashrabeya windows of the house from outside, and view the open air hall. Afterwards, I entered another hall of the haremlek area with more unique mashrabeya screens. The pieces of wood in these screens are designed to be very close to each other, making it impossible for anyone from outside to see through it while enabling the women of the house to look at the street and the sahn. 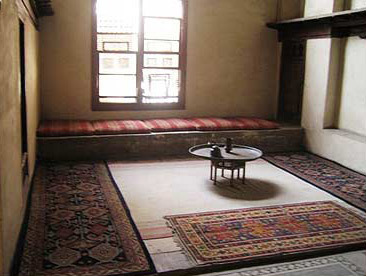 This room was used for women to welcome their guests and friends. Most of the room is decorated with brown and dark red colors, which seemed very feminine and suited the women's section. This area is restricted to women and young children. When a male child got older, it was preferred that he would not enter the room. This hall contained some objects that the women used, such as alabaster dishes and plates. There are two high, stained glass windows that are very attractive. pillows on the floor for women to rest on and many cupboards to hold their necessities.many cupboards to hold their This room, in particular, was strictly for women. No men, other than sons and the father, were allowed inside. The bathroom section is the most interesting place in the house. It is divided into three sections. The first section is the cold water section. It is a very small room with a wooden cupboard inside where they used to keep the cold water in a huge container. This room has no ceiling so that the gold wind could come and cool down the water in the cupboard. The second section of the bathroom is the massage section. It is also a very small room with only a big wooden bed to the right. 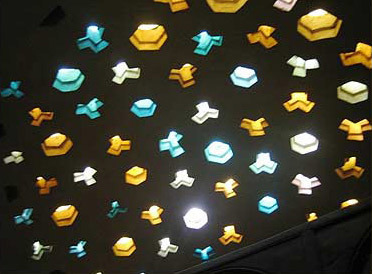 It has the most amazing ceiling I have ever seen, with small, star shaped openings in it which are covered with blue, orange, and white glass. When the sun light enters the room through these openings, it is like looking at the stars in the sky on a very clear night. I have seen massage halls in five stars hotels and in health clubs all over Egypt, but nothing like this room. Having a massage in this room while looking at the sky would be like gazing into heaven. The third section of the bathroom is the hot water section. It has the same amazing ceiling as the massage room. In the middle, there is a water tap, and to the right there is a big container that was used for keeping hot water. There is also a cupboard behind the tap that was used to keep the bathing items. After the tour, I was told by the guide that this room was used as a sauna. They used to let the hot water fall on the floor, where three small openings in the wall enabled the water flow out of the room. 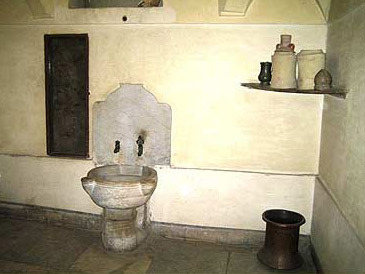 There is also a toilet section, which is like most of the "Balady" toilets we still have in some places in Egypt. It is just a small hall in the ground that takes the waste into pipes and out of the house. This was the last place to visit in Bayt El Suhaymi because the third floor is in ill repair and nobody is allowed there. Also, the guide told me that it is empty and doesnt have any decorations or furniture. 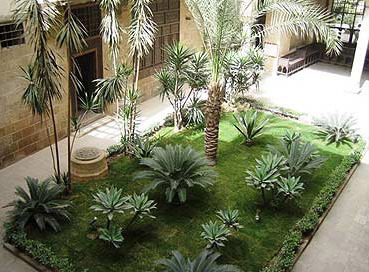 So now it was time to visit the garden of the house, which is next to the sahn. The garden is big and full of very beautiful greenery. I believe it is being watered daily and it is well maintained. To the left, there are pictures of the house before and during the restoration period. 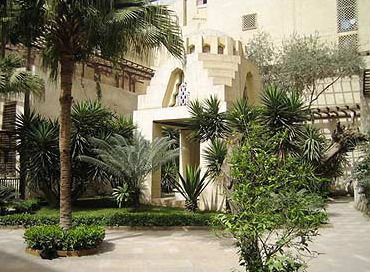 The house was in bad shape, but due to the efforts the Egyptian government, it is now very elegant and as it was in the past. 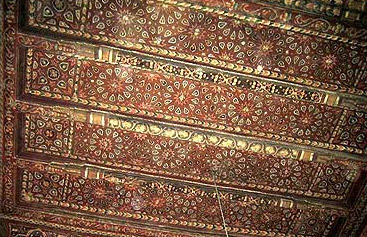 Above these pictures there is a new mashrabeya screen designed by the artists of the restoration. 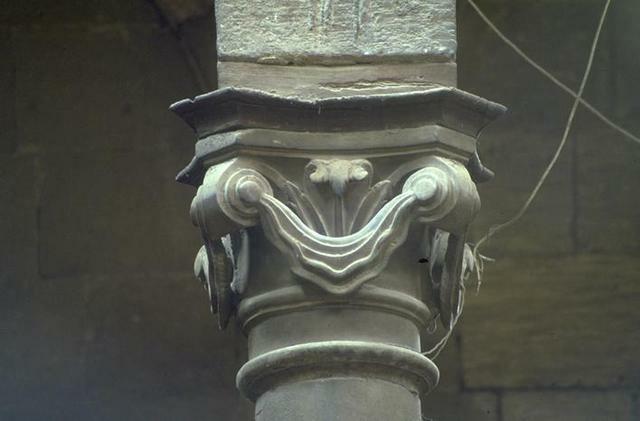 It records the restoration that took place between 1997 and 1999. I also enjoyed the very old trees that are spread all around the garden. Some of these trees are as old as the house itself. They give the garden a unique appearance. After an amusing visit to the Suhaymi House, as I was leaving Darb El Asafar, I noticed to my right an amazing old mosque that looked different than other mosques in the area. 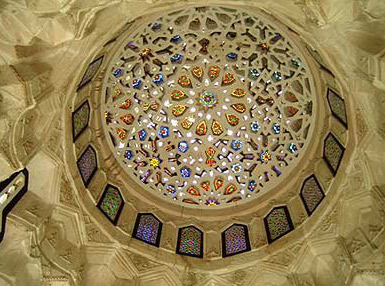 It is designed like the Mohamed Ali Mosque in the Citadel, in the Turkish style. 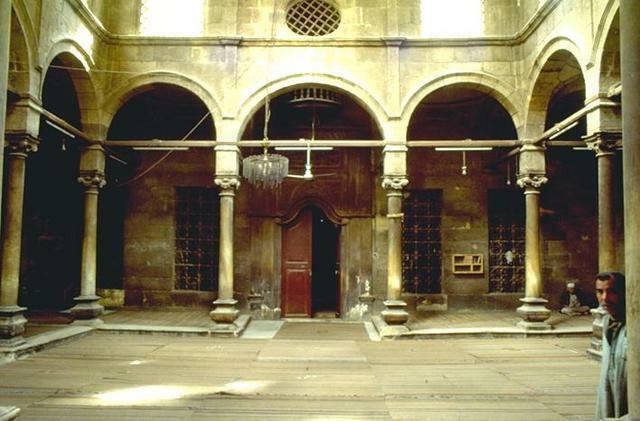 I found out that it was the Mosque of Suleiman Aga El-Silahdar which was built in 1839. It has appealing decoration on it's walls, as the Turkish style in mosques is very attractive. 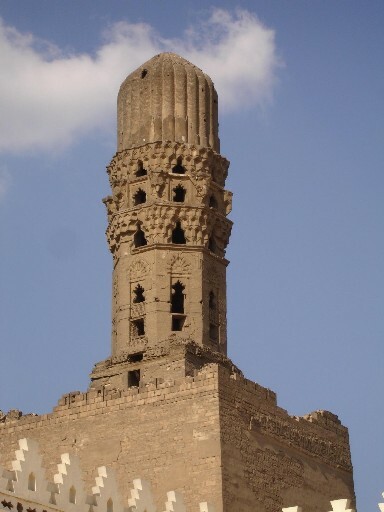 The thing that really grabbed my attention was the minaret of the mosque, which looked like a sharp pencil and didnt have many decorations around it like most others in Egypt. Mosque-Sabil of Sulayman Agha al-Silahdar or Mosque-Sabil-Kuttab of Sulayman Agha al-Silahdar (Arabic: مسجد وسبيل سليمان أغا السلحدار‎) is a complex of mosque, sabil and kuttab established during the era of Muhammad Ali Pasha in Islamic Cairo, the historic medieval district of Cairo, Egypt. 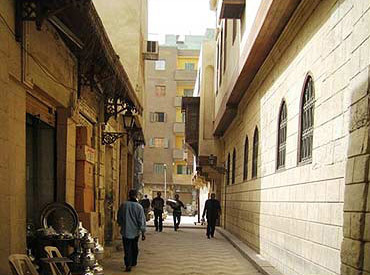 It is located at the beginning of Burjouan alley of the famed Muizz Street.On the other side it faces the extension of Al-Nahasin Street leading to the Bab Al-Shaareya square. 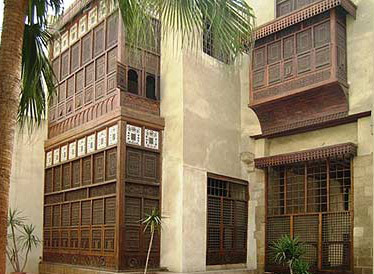 Wikala of Bazaraa, is a 17th-century commercial building in the Gamaliya area of Fatimid Cairo. 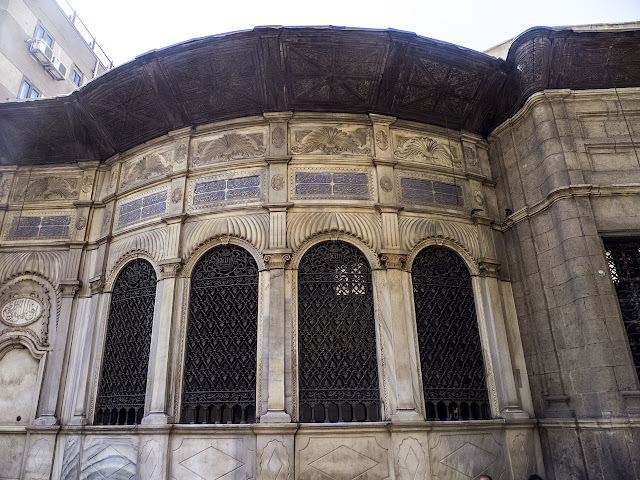 It took six years of painstaking refurbishment to restore the building, originally designed to house merchants passing through Cairo and including storehouses for their goods. 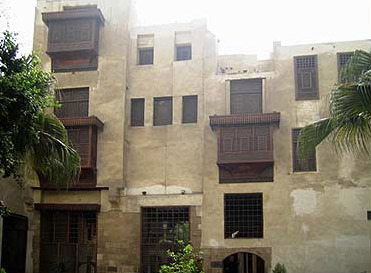 The Wikala of Bazaraa stands on Al-Tumbukshiya Road, off Gamaliya Street in an area of Fatimid Cairo that the Ministry of Culture is planning to restore and refurbish one section at a time. The ultimate aim is to transform the area into an open-air museum. · Poor sanitation and water leakage from the drainage systems in the area. · Decomposing the mortar of building and construction . · Creating a new sanitation network for the Wikala.